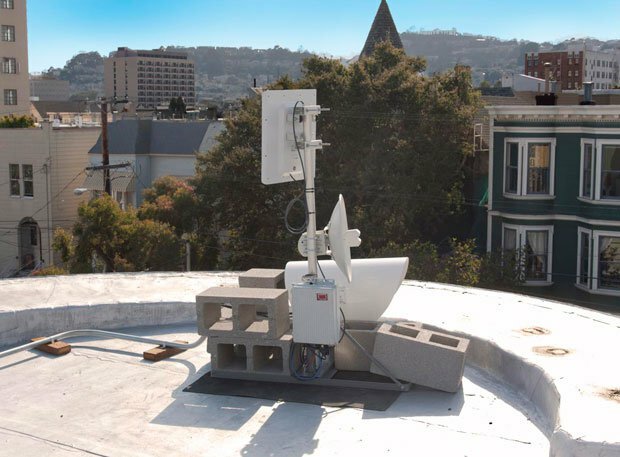 With hope for high speed fiber connections in San Francisco dwindling, local independent internet service provider (ISP) Monkey Brains is raising money on Indiegogo to roll out ultra high speed internet for residential customers via microwave antennae. The campaign, called Gigabit Wireless To the Home, is both ahead of its time and altruistic. The campaign – nearly fully subscribed – will cover the cost of a bulk order of high-capacity “links,” or microwave antennae, to provide customers with internet access. The company will cover the cost of installation for these early adopters, in part to establish the infrastructure for what Monkey Brains and others predict will be a service in increasing demand. Meanwhile, the fundraising campaign is also an opportunity for wealthier customers to purchase a link to be installed on a low or middle income rooftop. “Gigabit” refers to the speed, or bandwidth, of a connection. Most connections range from 10 to 60 megabits per second of information exchanged, though what customers see may actually be much slower. Monkey Brains wants to offer 350 to 500 mbps- not really a gigabit per second, but vastly more than any other connection available now, for their standard residential connection price of $35 per month. Such high capacity connections have previously been available only to business clients, mostly because the necessary equipment is so expensive: A single link costs $2,500. So why would you need speeds that Monkey Brains itself describes as “insane”? Paul Barwick, a local retiree and MonkeyBrains customer who used to work in telecommunications, asked himself the same question. On a Social Security and veterans’ disability benefits, the investment would have been substantial for Barwick. Luckily for him, a close friend has covered the cost of the link and he is signed up. “The honest answer is that for the immediate future I will have just gotten myself some bragging rights,” Barwick wrote in an email. But a little ways down the road, he said, this bandwidth will open up new opportunities as they become available. Barwick is a Monkey Brains customer already, at the standard residential bandwidth level. Residential speeds are advertised as ranging from 8 to 20mbps, but Barwick sees around 60 mbps. Before he had access to that kind of speed he couldn’t store documents or data online, and couldn’t make video calls. He said he expects gigabit speeds to pick up in popularity and availability in the near future. “At present time gigabit or near-gigabit speeds are at that point where many of the things we take for granted now once found themselves,” he wrote. More bandwidth basically means more people can up- and download more data at the same time on the same connection said Jeremy Gillula, a staff technologist at the Electronic Frontier Foundation. He too predicted that gigabit or near-gigabit speeds are the way of the future. Just last week, he said, the FCC increased the bare minimum speed for a connection to be considered “broadband” from 4 to 10 mbps. Though most connections are advertised to reach speeds of 25 to 50 mbps, users often see much slower speeds in practice. But the increases to the minimums, Gillula said, will probably keep coming. Thus the push to expand high speed internet across the city now rather than waiting for fiber optics to arrive, which is unlikely. Monkey Brains has made attempts to work with the city to build on the city’s existing and underutilized fiber network or install a new fiber network with minimally invasive methods, but various city policies stalled that work. So now Monkey Brains is developing its high speed network above ground. Whether or not the company meets its fundraising goal, the links will be purchased and start going up around the city. Around 80 people have expressed interest in the high-speed links, Menendez said, and around 100 are needed. Some will be ineligible and be refunded, since the microwave antennas need a line-of-sight connection to one another. But it’s not just people with and extra $2,500 sitting around who can help expand the high speed network. For $100, Monkey Brains can install a repeater next to the high-speed antenna that will bring roughly 20 mbps completely free internet to anyone in nearby buildings. And Menendez also said he’s seen residents in multi-unit buildings come together to cover the costs and prompt a landlord to consider installing the antenna. At some sites, newly installed links will expand Monkey Brains’ service to new parts of the city. At one site, Menendez said, the signal will be able to “leapfrog” off the first high-bandwidth link. He estimated about 20 percent of requests that have come in for Gigabit to the Home are potential expansion points. That’s good news for residents who are fed up with the slow, expensive and poorly executed services of bigger corporate ISPs, but who might be outside MonkeyBrains’ line-of-sight coverage areas, or who might not be able to swing the high installation costs. Barwick, who used to work for Viacom, said frustration with existing services was a huge factor for his original switch to the independent ISP and a good reason to support competition in the market. Gillula at EFF also said that supporting independent ISPs is important to fostering much needed competition that could precipitate improved services — Smaller providers are more likely to be responsive to customer’s concerns. And there’s also the altruistic component of raising funds to install links in lower-income communities. There are 4 days left in Monkey Brains’ Indiegogo campaign, and just $1500 remain to be raised (assuming Monkey Brains does not establish stretch goals). The new links are expected to be rolled out in February. Posted 12/14 @ 9:40 a.m.
NextGood Morning Mission! On the Move! “Monkey Brains wants to offer 350 to 500 mbps- not really a gigabit per second”… So, the gig was a lie. Nice. Do you feel “lied to”? Gigabit refers to capacity.. They are up front about actual speeds delivered, never promising Gigabit.. that’s just the name of the campaign.. I have Monkey Brains. It is the best. One of the best companies from around here without doubt.